Amateur astronomer David Levy delivers a lecture to a branch of the Royal Astronomical Society of Canada in Ottawa, May 31, 2013. OTTAWA, ONTARIO — Two decades after the comet Shoemaker-Levy 9 slammed into Jupiter, co-discoverer David Levy expressed delight that water in the planet's atmosphere was recently traced back to the colossal collision in 1994. "I was blown away!" Levy told SPACE.com on May 31. It was as though the comet, he added, "said 'OK, I'm going to do this and you're going to watch', and that was that." With 23 comets to his name, Levy still spends his spare evenings searching for the 24th. He does so despite giant automated telescopes making it tougher for amateurs to spot comets before computers do. Levy and his fellow observers first spotted Shoemaker-Levy 9 in March 1993 when comparing two camera film frames taken at the California Institute of Technology's Palomar Observatory. A smudge on the film moved, adding another discovery to the team of Levy and astronomers Carolyn and Eugene Shoemaker. Amateur astronomer David Levy in front of the two "discovery" pictures of Shoemaker-Levy 9. 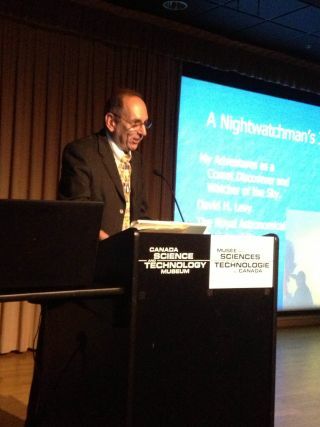 Levy delivered a lecture to a branch of the Royal Astronomical Society of Canada in Ottawa, May 31, 2013. Before long, scientists realized the massive comet — already torn into pieces by Jupiter's strong gravity — was going to make several direct hits on the planet. Between July 16-22, 1994, nearly two dozen collisions took place. The sulfur-filled smudges in Jupiter's atmosphere persisted for months and were visible in even amateur telescopes. Levy and the Shoemakers discovered 13 comets together before Eugene Shoemaker's sudden death in 1997 from a car accident. Levy, invited on the team because he found a bright comet by himself, became adept at quickly loading and reloading the film canisters for images, all to make the most of limited telescope time. Laughing, Levy said he realized the skill sounds very antiquated these days when CCDs take the pictures, but he was still proud of it. Today, the Canadian-born amateur astronomer searches for comets from his Arizona backyard with more than a dozen small automated telescopes. Levy uses an additional telescope to peek through the eyepiece himself looking for celestial wanderers. But can Levy compete with the Solar and Heliospheric Observatory (SOHO)? Launched in 1995, NASA's sun-gazing observatory has snagged nearly 2,400 comet discoveries to date, according to the Naval Research Laboratory. Amateurs have reported it is harder to make discoveries with that comet catcher doing its work, but Levy said he is undaunted. "I think it's possible," he added, smiling. Levy has never taken an astronomy course, but in 2010 he completed another academic endeavour: defending his Ph.D. in English with the Hebrew University of Jerusalem. A stroke hit Levy mid-thesis writing, but the first chapter he completed after his recovery got more praise from professors than those he wrote previously, he said. The topic was astronomy as described by writers in the time of Shakespeare. The Bard, Levy said, made more references to space in his writings than any other person of his time. Levy's favorite quote is what he believes is a reference to a solar eclipse: "Hung be the heavens with black, yield day to night," read the opening line of Henry VI. "They had a black curtain in the theater at the time to show the difference between day and night," Levy said, but added that an eclipse is the only time when darkness falls suddenly in nature. While eclipses are a fascination of Levy's, comets remain an important professional and personal interest of his. "I think that comets are the main item to prove the night sky is not a static thing," Levy said at Ottawa's Royal Astronomical Society of Canada lecture that night.